World Cup quarter-finalists Ghana cruised to a 3-0 win over Swaziland in their opening 2012 Africa Cup of Nations qualifier in Mbabane on Sunday. 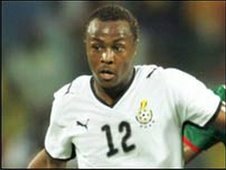 Midfielder Andre Ayew, a son of African football legend Abedi Pele put the Black Stars ahead on 13 minutes. Germany-based striker Prince Tagoe struck the second midway through the second half to double their lead. Schalke left-back Hans Adu-Sarpei completed the rout with a strike from the edge of the box. An opening-round curse struck Egypt again on Sunday when they were held 1-1 at home by lowly Sierra Leone in a qualifier. The defending champions were rocked on 56 minutes at Cairo Stadium when Turkey-based defensive midfielder Alhassan Bangura edged the plucky West Africans in front. Defender Mahmoud Fathallah completed a pair of unlikely scorers when he equalised four minutes later, but a winning goal eluded Egypt who began with six of the team that defeated Ghana in the 2010 Nations Cup final. Coach Hassan Shehata had warned his team about the perils of not making a winning start, blaming their failure to reach the World Cup in South Africa this year on a home draw with Zambia in the first qualifier. Egypt are ranked number one in Africa this month by world governing body Fifa and Sierra Leone 36 and the visitors lacked their best known footballer, China-based playmaker Mohamed Kallon, who is injured. Turkey-based striker Mamadou Niang snatched the first hat-trick of the competition as Senegal surprised defensively brittle DR Congo 4-2 in Lubumbashi with Patou Kabangu on target twice for the losers. Nigeria hardly raised a sweat as they triumphed 2-0 against Madagascar in southern city Calabar through clinical first-half finishes from strikers Obafemi Martins and Michael Eneramo. Cedric Amissi earned Burundi a surprise 1-1 draw in Benin by scoring five minutes from full-time and Liberia had to come from behind to produce the same score against Zimbabwe in Paynesville. Ghana are ranked second by Fifa in Africa and Swaziland 35 so the result was entirely predictable and took the winners to the top of Group I on goal difference from Sudan, who defeated Congo 2-0 in Omdurman on Saturday. Zambia were also in the mood for goals, scoring four without reply against international rookies Comoros Islands in Lusaka to take an early lead in Group C after Mozambique and Libya fought a goalless Maputo draw. Comoros, a group of islands off south-east Africa and competing in the qualifiers for only the second time, admitted before a game delayed 24 hours by the late arrival of the Eritrean match officials that they had little hope. And their defensive resistance lasted just five minutes before Rainford Kalaba gave Chipolopolo a lead that Fwayo Tembo and James Chamanga added to before half-time. Zambia found it more difficult to carve openings in the second half and supporters had to wait until seven minutes before full-time to see the net bulge again as Emmanuel Mayuka completed the scoring. Mozambique will be disappointed not to have taken maximum points off Libya at Machava Stadium on the outskirts of capital Maputo with the North Africans making their competitive debut under Brazilian coach Marcos Paqueta. Another new coach, Scotland-born Iffy Onuora, suffered a debut from hell as Ethiopia crumbled 4-1 at home to Guinea, leaving the East Africans with five fixtures to play and virtually no hope of making the finals. Egypt, seeking a record eighth title and fourth in a row, launch their Group G campaign late Sunday at Cairo Stadium against Sierra Leone and are expected to win comfortably. Gabon and Equatorial Guinea will co-host the 2012 Nations Cup, the first time the tournament has officially been split between two countries since it was launched 53 years ago in Sudan.